I’m struggling to put into words what I’m thinking about my current MMO situation. I’m raiding in Swtor, I’m exploring Secret World, I’m not caring in WoW and I’m curious about Gw2. I’m pretty much playing four MMOs at the same time and so far I’m managing well just by spending a bit of time here and there. How I got to this point I don’t know for sure but when I think about it I think it’s simply because no MMO seems to be able to satisfy my all on its own. Let me start off with the Secret World. It’s a great exploration MMO, right up there with Lotro (which I need to get back to…) and every time I play it I come away with that great feeling you get after seeing a good movie. The downside though is that I’m pretty much the only one playing it in my circle of friends and as far as endgame goes I don’t think it would be a good fit. Guild Wars 2 is really more of a curiosity thing on my part. Normaly I wouldn’t have considered it but I was curious and since there’s no sub I felt like I wasn’t losing anything. So far I don’t think it’s a bad game but it just doesn’t click… I’m giving it more time to see if it gets better later on. Swtor… well… Swtor is where the people I love raiding with are. That’s pretty much it. The more I think about it and the more I think this should have been a single player game and not an MMO. The game is great when you level the first time around but the endgame is atrocious. Dailies are a pain, game performance is poor and I just don’t feel like logging in unless there’s something going on. The raids themselves are okay but by themselves they wouldn’t get me to subscribe. Why am I still playing? Because as I said so often, that’s where my friends are and playing with these people is enough to keep me playing and enduring dailies. And we come to WoW, the game I never thought I’d play again. When I resubed it was mostly to get rid of the nostalgia bug and also to keep in touch with some people. And then I’m finding myself playing more than I thought I would. I don’t know exactly how to explain it but there’s something about WoW that’s relaxing. I don’t have to over think anything, I can just go out and kill mobs, get a cute pet and call it a day. I think I was missing this simplicity. So that’s pretty much me right now. Anyone else stuck like me? I’m thinking of making something like Altholics anymous but instead call it Gameaolics anonymous. Swtor future might be uncertain and I’m one of the first to say that EA/Bioware need to fix their game asap but the fact remains that beyond all the recent commotion there is a solid game in there that maybe you’re still playing and feeling a bit desperate that you can’t raid to your heart content and/or see the content. If that’s the case then maybe Snark Side is the place for you. We’re currently looking for a good healer or dps or dps/healer on Canderous Ordo to join us. Not on the right server? No problem! You can still join us as a low-level character so you have company while you level to 50. Snark Side is a raiding guild for people with lives and real life commitment that actually get stuff done unlike many such guilds that have tried it before. We have completed most content on story and hard mode and we have now started working on Explosive conflict hard mode. We might not be the fastest or the most elite players out there but we do get there eventually. We’re also a tight-knit community that followed each other from WoW to Swtor and even to other games when some of us feel like playing them on the side. For me this is our best trait, being in a guild where I genuiely enjoy playing with the people I’m playing with. If that is something that interest you, please go to the site and aply. Now that the sales pitch is done I wouldn’t feel honest doing this without talking about the state of the game and how it affects the guild. Swtor right now is in a tumultuous state and it has taken its toll on us. While we all keep in touch, some of us have moved on from Swtor and depending on the next moves from EA it could affect us further. We are still raiding, we are still playing but the future is uncertain for everyone I think at this point and we’re not immune to that. Still, if you’re looking for a great group, you’ll find it with us regardless of what may happen with the game itself. Nothing really special t0 talk about today. Or rather I’m trying to write a post on how screwed up raid difficulty can be sometimes but I just can’t find the right way to say things so you are stuck with gaming updates instead. Snark side has started to tackle Explosive Conflict hard mode for real last weekend. We got our asses handed to us but we came really close to beating them a few times (including a 1% wipe) so I’m thinking that it’s just a matter of tuning the gear some more and keeping at it. If not I’m watching closely the announcements about F2P to see if I’m going to remain a customer or not. I did play a few hours just to get that damn nostalgia bug out of my system and it worked well enough. I don’t think I’ll make a full return but a few hours here and there are nice enough and it allows me to keep in contact with friends. It also made me appreciate Swtor some more by being reminded of why exactly I couldn’t wait to be done with WoW. Made some progress in the Savage cost and I got back to where I was with my first Illuminati character. I know I’m taking forever and that just how I like it. I just waste ton of time exploring all the little nook and cranies. Slow progress but I’m just having a blast playing it. Finished Darksiders (the first one) over the weekend and it was a fun enough game. It wasn’t perfect but I thought it showed a lot of potential and I’m really curious about the second game now to see if they improved on the formula. definitively a game I’d recommend. I also started playing Sleeping Dogs after reading all the rave reviews and so far it’s not disapointing. I’m usualy not a big fan of GTA like games but this one might change that. With all the recent happening with Swtor, EA and Bioware a lot of rumors are flying around, some that sound reasonable and others that are just crazy. I thought I’d list some of the recurring ones I’ve been seeing lately and I’ll let you judge whether they could be true or not. EA is trying to sell off Swtor to another company and will then shut down Bioware. If anything this is one I’d like to see come true. Not the shut down Bioware part but I think anyone else other than EA to handle Swtor is fantastic news. EA will close down the game as soon as it pays back the investment cost. F2P is only a ploy to get money faster. I’m not much into conspiracy scenario and I don’t think EA would want the bad publicity it would get from doing a move like this. If the subs number keep dropping at the rate they are, there will be less than an 100k players playing by christmas. While I don’t believe anyone could make an accurate assessments of numbers beside EA, I am curious as to how the game will hold up with GW2 and Pandaria just around the corner. Jeff Hickman real job is to make the game pay for its investment cost and then shut down the game. This is a variation on the earlier rumor about shutting down the game as soon as it meets its investment cost. Jeff Hickman is really a Blizzard employee sent to sabotage EA from the inside. I don’t think it’s true but it’s funny nonetheless. So, any more rumors out there I may have missed? Even if I don’t believe much of the above is true if any at all, I do think something is happening that we’re not being told. Rumors usually don’t get that crazy unless something is happening. What that something is though I have no idea. Is there pandas in my future? Today I’d say it’s likely, tomorrow I might say it’s not happening and who knows what I’ll be thinking two or three weeks from now. I get more and more the distinct feeling that I’m sitting at a crossroad of some sort. Swtor is not turning out to be that great game I thought it would be. It’s buggy, the replayability is low for someone like me and really the only thing I find interesting in it is the raiding which I feel is nicely done and has some originality. If it wasn’t for Snark Side I’d have likely cancelled my subscription in early summer. But I’m part of that wonderful group of people that is Snark Side most of whom I’ve come to consider as real life friends after all that time spent together. The original plan when we moved to Swtor was to have this great group and raid together forever in the new happy Swtor land. But taken for its own merit Swtor isn’t that great and I feel Bioware and EA are wasting a ton of potential. The ingredients are all there to make a great game but it just doesn’t seem to be happening and Bioware/EA just can’t seem to fix their problems. So what was bound to happen when you have a less than game is happening. Our group is starting to splinter due to simple attrition as people lose interest in the game. We have our die-hards but it still hurts the guild as a whole. On my end I want to keep raiding with them and I don’t especially want to quit but the latest announcements to the f2p model are unnaceptable to me. I won’t subcribe to raid and on top of it pay for new content. Either I sub and have access to everything or I pay per content (like Lotro) but not both at the same time. What I’m saying is the independent of my feelings toward my guildies which I thought I’d never ever leave, it seems like I found my limit when it comes to what I’m willing to accept from EA. When I left WoW back in December I did so thinking I’d never return. I didn’t exclude it because you never know what can happen but I thought I was done with WoW for a very long time. Now, I’m not so sure. See, some of the people who are leaving Swtor are heading back to WoW and I’m considering joining up with them if I end up leaving Swtor as well. Not because WoW is the best game ever but simply because it’s the game that happens to be one where some of my good friends are heading back to. You gotta hand it to Blizzard. No matter what you may actually think about their game, they still make some of the best cinematics around. Investigation missions are one of the big draws of the Secret world and quite a treat for anyone like me who loves a good puzzle and mystery. Not only that, but they are all sufficiently different from one another that you can’t solve them all the same way. While most use the Internet in some form, some will have you lookup references, another deduce code and another could be based on math or science. Usually, each of these mission has a method to solve it that usually carry one through most of the mission. For example, if a mission is centered around Bible references, you can solve most of the mission by looking up Bible verses for example. The trick then to solve investigation quests is to figure out what is expected of you and that in itself is the biggest challenge. Now this is the part where I get to admit that despite loving puzzles and giving them a lot of thought, I have cheated on at least one step of each investigation mission I have done save one. Most of them my cheating involved searching the web for how exactly does Funcom expects me to go about solving the puzzle. See, one of the hard part of puzzles is that sometimes you think it’s about finding out references about what an NPC just said when it fact that puzzle is about inventory manipulation. You can get stumped a very long time before figuring out you were searching in the wrong direction. But yesterday, I finally managed to complete an entire investigation quest from start to finish without looking at any guide or cheating in any way and it felt incredible. I really need to do this more often because it was one of the most rewarding things I have ever done in an MMO, on par with server first kills and the like. 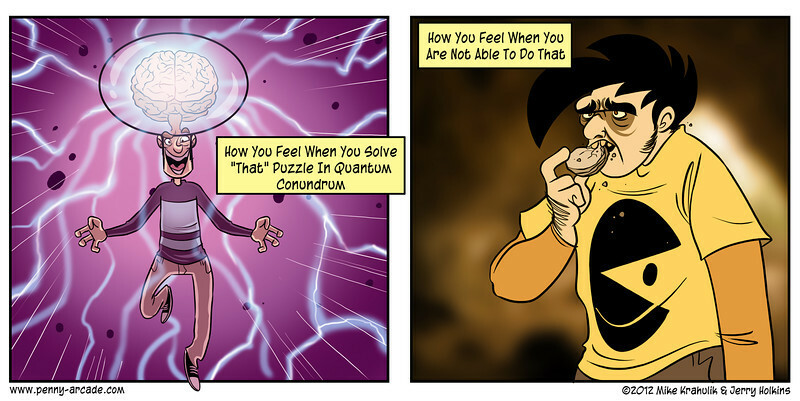 I think Penny-Arcade captured the feeling better than I can with words.